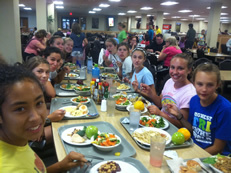 One of the first questions parents ask is “where will the camp be held and will my son or daughter be eating well?” We can assure you that our accommodations are very good and the meals are nutritious and delicious. We will be staying in one of the numerous lodges at the YMCA of the Rockies where all of the campers will be roomed together in groups of 4 or 5. Each room has two sets of bunk beds and one standard size bed plus a full bathroom with shower. While the rooms are not the Ritz, they are more than comfortable and adequate. The YMCA of the Rockies is located approximately 4 miles from downtown Estes Park and on 850 acres of mountainous terrain near Rocky Mountain National Park.It is a very secure setting which also welcomes several thousand visitors during a busy week. You may Google in the Y facility to learn more about their numerous camp offerings. Most of the meals at the Y will be eaten in their cafeteria which has a lot of choices for breakfast, lunch and dinner including meals for vegetarians. The cafeteria meals are also “all you can eat” which is great for the runners burning thousands of calories during the day! 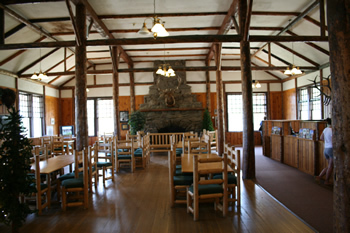 In addition to the cafeteria meals, there is a snack bar in the main lodge as well as an ice cream parlor there for evening enjoyment. Also, on occasion the group will be going into the town of Estes Park where we will have lunch. And, while in Boulder, we will include a picnic as well as a full dinner at the Olive Garden Restaurant where we will conclude a full day of visiting the University of Colorado, running on the famed trails around Boulder and enjoying Pearl Street Mall. For some of these activities, each runner should have a little pocket money. Total for the week might be $100. We don’t recommend that boys bring a lot of money to camp.